Queens today deserved the point that a late second half comeback had looked like securing, however in the last few minutes Partick substitute McGrillen managed to squeeze the ball over the line from a corner to steal the points and leave the visiting fans singing the theme from "The Great Escape". For long periods of the match however even this close an ending had looked unlikely for Queens as the slick passing play of the Partick side made the Dumfries men chase their tails for much of the first half an certainly the first fifteen minutes of the second. The entire first half was practically a non event for the Doonhamers forward line with little success if any coming from a more direct style of play. Some moments of note were a lovely crossfield ball from returning loan signing Stewart Davidson from Kilmarnock, his ball finding Paddy Atkinson who cut the ball back for Warren Hawke who could only blast the ball over the bar. 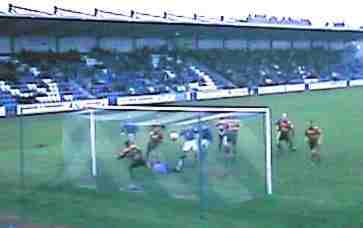 The defence then became static as a corner from Danny Lennon was met by the head of the unchallenged Scott McLean to head through a group of players just beating Mathieson to make the score 1-0 to Thistle. Shortly after Stewart Greacan became a victim of the slippery surface as he came off worse in a tackle and had to leave the pitch immediately, eventually to go to the infirmary with knee ligament damage. He was replaced by Phil Nixon who again looked reasonably comfortable alongside the ever reliable Andy Aitken in the middle of the pitch. The last action of the half was an opportunist lob by Bryan Caldwell from thirty yards out which sailed over the bar then he followed up by collecting a loose ball from a corner in the box sharply turning but seeing his shot easily held. Queen's started the second half in the same formation and with the same personnel that they had ended the first, Partick continued their dominance of the game and twice Scott McLean had free headers well saved or wide of the target. Caldwell was then replaced by reserves top scorer Jarrod Suddick, immediately he and Weatherson looked more comfortable with Weatherson moving wider and allowing Suddick more scope in the middle. After a few more minutes Queen's suddenly seemed to wake up, really starting from a fierce midfield battle involving Hawke, Davidson and a couple of Partick players, this seemed to spur on the rest of the team and for the remainder of the match Queens dominated. A Sunderland/Pickering/Sunderland combination produced a delicate flick over the heads of the defence only for Peter Weatherson to put too little on it and the 'keeper to hold it easily, Queens had raised the tempo considerably and Partick were on the back foot a goal looked likely. Next the hardworking and skilful Stephen Pickering made a surging run down the right and putting in a tremendous low drive only to see it slid away from Peter Weatherson's toe by a Partick defender, Queens then having a couple of corners at which the visiting defence looked none too comfortable. Further pressure yielded another four corners in succession, the fourth bringing the richly deserved reward, the ball in the middle, a scrum of players and Paddy Atkinson making no mistake as he drove the ball home with purpose from all of four yards. Paddy Atkinson smashes home the equaliser. The pressure play continued and Paddy Atkinson was taking charge of midfield, every ball seemed to drop to him and his experience was put to good use as time and time again he released either Weatherson down the left or Pickering down the right. Another goal was not to be for Queens however and in a cruel ending the visitors snatched the winner in the eighty seventh minute, despite having time for a further foray upfield and a corner Queens could just not break through the Jags defence and a defeat was recorded.